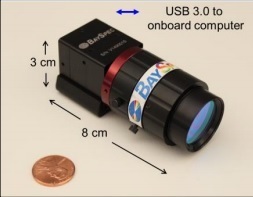 BaySpec, Inc., a leading provider of miniaturized spectral engines, introduces the OCI-UAV™, a new ultra-compact version of its award winning OCI-Series Hyperspectral Imagers. The OCI-UAV™ hyperspectral camera is designed specifically for use on unmanned aerial vehicles/systems (UAV/UAS), remotely operated vehicles (ROV), or anywhere needed. Without compromising performance in this small form factor, the OCI-UAV™ with miniature single-board-computer acquires VIS-NIR hyperspectral data with continuous spectral and spatial coverage. 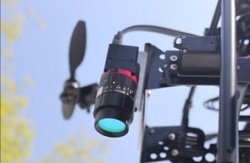 Operating the OCI-UAV™ is automatic and requires minimal human set-up. The OCI-UAV™ design features signification reduction in size (camera head only 8 cm x 3 cm x 3 cm with a computer 10 cm x 7.5 cm x 3 cm) and weight (approximately 0.6 lb., ~272 g), and faster data transfer rate (up to 120 fps) with automatic data capturing and processing. Unlike conventional hyperspectral imagers, which rely on intensive software efforts for orthorectification, the OCI-UAV-1000™ features innovative "True Push-broom" where the imager can move to scan at random speeds. The OCI-UAV-2000™ is a snapshot multispectral imager that fundamentally eliminating artifacts caused by vibrations in flight. These advancements significantly reduce requirements on UAV/ROV integration. BaySpec also provides ready-to-fly hyperspectral total solutions. Augmenting the extreme compactness with uncompromised performance, automatic operation and data processing make the OCI-UAV™ a straightforward system for applications, such as: precision agriculture, airborne mini UAV/ROV, remote sensing, ground survey, forest survey, environmental studies, law enforcement, forensics, security and defense, mining and geology, oil and gas exploration, ocean monitoring, among others. Where Do You Want To Image Today? Visit us at the HSI 2014 show, October 15-16, 2014 at the Ricoh Arena in Coventry, UK at the Mapping Solutions booth. For more information or to discuss your application requirements, please contact BaySpec by phone +1(408)512-5928, [email protected] or visit us on the web: www.bayspec.com/hyperspectral.